In support of World Cancer Day (February 4th), Global Payments, a provider of payment technology and software solutions, donated £38,000 to Teenage Cancer Trust. 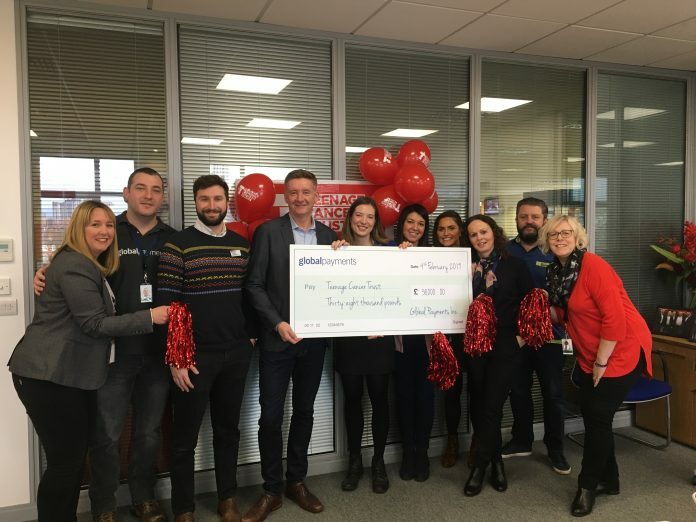 Global Payments employees at Leicester office adopted Teenage Cancer Trust as their nominated charity for 2018 and held numerous events and activities throughout the year to raise funds. The highlight was the Global Peddlers’ bike ride where a team of eleven cyclists rode 100 miles on the roads of Leicestershire to raise more than £6,000. The Global Payments team also worked with Teenage Cancer Trust to provide unique opportunities for young people with cancer, including hosting them in a Hospitality Box at a Leicester Tigers Gallagher Rugby Premiership match, where they also had an opportunity to meet some of the players.